Godspeed You! Black Emperor at The Slowdown Feb. 10, 2016. Even if you’ve never seen Godspeed You! 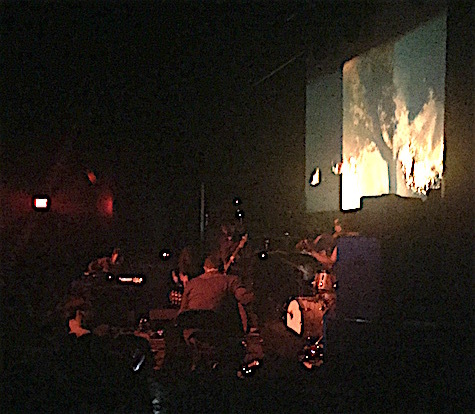 Black Emperor before but are familiar with the band’s music you pretty much knew what you were in for last night at The Slowdown. Five minutes before the band walked onto the darkened stage a low-end rumble quietly roared like distant thunder. One at a time the eight members found their places among a stage cluttered with equipment and pedals and cables, looking for a place to set down their drinks, and quietly picked up their instruments, each adding to the building din. This went on for another five minutes or so as scratchy abstract marks began being projected on the screen behind the stage. Eventually, the noise took form. Two percussionists began rattling things as the violin and cello added something akin to a melody that ultimately was overtaken by the three guitars and bass, and 15 minutes later you realized the concert had indeed begun. Most compositions (songs?) were deep, repetitive ambient tonal melodies that evolved into haunting and/or majestic sweeps of sound. Sludgy, slow, deep ponderous movements were played in dim, deep-red sepia lighting, perfect for setting a mood or developing film. Overhead, the projections became less abstract — images of burning fields, film sprocket holes, a deer standing in a field, a sunset shot from inside a moving car — all in black-and-white (of course). There wasn’t much to see on stage except lots of people leaning over things, huddled over guitars or effects pedals. Sometimes the compositions transformed into big rock numbers that reminded me of Meddle-era Pink Floyd or Mogwai, but most of the set was a pulsing dirge set to a 6/8 beat. Throughout the set, none of the performers talked to the audience. There were no microphones on stage if they’d wanted to. It was beautiful and awful and exhausting. The set began at a quarter after 9. When I left at 11 and it was still going strong, the sold-out crowd standing in front of the stage was transfixed, mesmerized. They’re calling it Bands for Bernie. It’s a rally for Bernie Sanders at Reverb tonight. Bands playing include CJ Mills and Lincoln punk band Once a Pawn. The free show begins at 7 p.m.
Also tonight, Fizzle Like a Flood’s Doug Kabourek does a rare set at The Barley Street Tavern. It’s part of a free six-band show that starts at 7 p.m.
It’s too bad you left early and didn’t come prepared for the experience. This was a once in a lifetime concert for Omaha’s Godspeed fans, I myself drove over 400 miles roundtrip to see them perform last night. Godspeed’s music takes two forms: dark ambient drones, and heavy epic arrangements. Notable songs included Mladic (what the opening drone turned into), the entire Asunder, Sweet and Other Distress album (in order), and a few oldies from their earlier days, plus a few drones and ambient violins thrown in for good measure. It was beautiful, and haunting, and destructive, but it wasn’t awful. Godspeed’s message is HOPE, and their music is the cathartic medium. I have to agree largely with the author, perhaps more emphatically in the negative. I am, indeed, both a fan of Godspeed and “difficult” listening. However, the sheer volume of the band blew out the delicate balance I expected. Perhaps it is because I don’t own all of their records. A pair of earplugs would have helped. I found that the show’s final act was the strongest point–along with the projections. However, I was expecting more strings and less epic and brutal feedback. I felt the opener, Xylouris White, were a better experience. I am really hoping to see Godspeed again in a different venue, as I’ve seen videos that reflect a more nuanced performance minus the indistinguishable wall of screeching noise. I’m starting to think the console operator should have been strangled.